What happens after you submit your data to Dryad? Ever wonder what happens to your Dryad data behind the scenes? Here’s a quick overview. Once a depositor has uploaded their data files and finalized their submission, the Dryad curator is notified of the new content. The curator looks at the uploaded files to make sure they really do contain data (and not, say, the article manuscript or pictures of kittens). The curator then exerts some quality control on the metadata, the description of the article and data files. She corrects errors, such as typos or formatting tags that are displaying incorrectly, and may enrich the metadata, by adding taxon name keywords, for example. Advanced metadata enrichment issues include the tricky realm of name authority control, which ensures that all works by a given author are gathered together despite the varying forms of their name. Once the curator approves the submission, the metadata description of the data goes live in the repository. The status of the data files themselves depends upon the embargo options selected by the depositor. Dryad DOIs (Digital Object Identifiers) are sent to the depositor and, in the case of our integrated partner journals, to the journal editors, so that they can be included in all forms of the final published article, and allow readers of the article to find the supporting data. 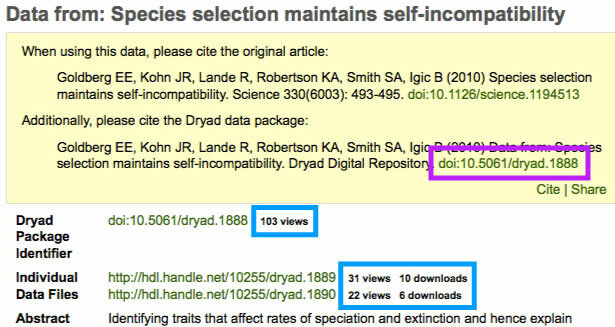 After the article is published, the curator adds complete article citation information, including a hyperlinked article DOI, to the Dryad record, and updates any data file embargoes, if needed. can be discovered independently of the article, as well as through the article. Additionally, authors can now track the views and downloads of their data files. Dryad displays the number of times the data package has been viewed, and the number of times each component data file has been both viewed and downloaded.